My husband Silas and I started our blog as a way to get him out of his horrible jobs, stop living paycheck-to-paycheck, and start traveling (since that was our passion). And now after having started our blog two years ago, we’ve been able to blog and travel full-time (you can check out our Instagram and see where we’ve been! ).We’re done with living on the edge and working the 9-5. We’re now able to determine our own hours and how much we want to grow our blog’s income. And to be honest, it’s one of the best things I’ve ever done! Which is why I want to share with you (whether you want to blog as a hobby or for profit) how easy it is to set up your own blog! I’m going to go over the basics for you so you know everything you need to do and how to do it. Also! If you want a great guide that will show you how to make money with a blog, you can check out my list of 5 ways to do just that! And if you’re curious about how to drive massive traffic to your blog like how I did within just a few months after launching my site, you can check out my step-by-step process here! So who Is Blogging For? 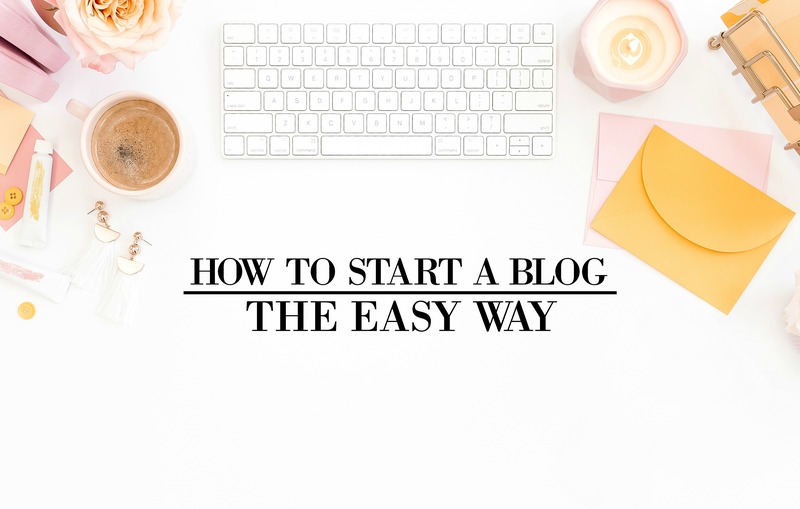 Now if you’re not sure if blogging is right for you, then this is an easy way to see if starting a blog is what you want to do. People looking to make a full-time income: If you’re looking for a side-hustle or a way to make money from home, then blogging is probably THE best thing you can do. It’s one of the only ways you can quickly start working for yourself and scale your income quickly. Hobby bloggers: If you want to start a blog on knitting, parenting, traveling, or anything else for fun, then go for it! It’s such a great way to express your creativity and show you people your work! The technically challenged: If you thought I was some tech genius when first starting out, then let me just tell you that it couldn’t be further from the truth. And thankfully, blogging doesn’t require you to have crazy amazing computer skills! It’s super easy to do, and with just a little bit of practice, there’s so much you can do. Now many people think that they can easily start a blog for free on WordPress.com or Blogger. But you DO NOT WANT TO DO THIS. Free sites like this can pull down your blog at any time and for no reason (I’ve known bloggers who have had this happen to them). So What Is Hosting? Hosting is like renting space on the internet. They’re the people that put your site out there live for everyone to see and make sure it doesn’t crash. But to be honest, it’s a little too technical for me to fully understand, I just knew I needed it if I wanted to have a legitimate blog. So Who to Go With: There are plenty of hosting sites out there, and some of the top are Bluehost, MediaTemple, and 1&1. Bluehost is the one I personally recommend since they have a great price for new bloggers and are seriously professional (they’re the ones basically everyone recommends). They were what I used when first starting out. So if you want to go with a hosting service that will help you out with anything questions you have, then I’d definitely go with them. Their hosting plan is $2.95/mo which is a special price you can only get through my Bluehost link, so definitely check them out. I also have a free step-by-step guide on how to set up your blog with them. PS – Your domain name comes free when you sign up with Bluehost. MediaTemple is a great one to go with when you’re more advance with your blog’s monthly income and pageviews. They also have great and fast service, and are super professional. So when you start making more money as a blogger, they’re something can totally think about. 1&1 is probably one of the cheapest one, but I wouldn’t really recommend them since they don’t have good support and a hard to understand platform. But if you’re really on a dime and don’t mind it for now, then go ahead and give them a look. Quick Note: With whoever you go with, you’ll want to connect WordPress to your hosting account. This can be done by simply clicking on one button in your hosting dashboard. WordPress is where you write your blog content and manage your site. Once you sign up for hosting, you can get a domain name (and like I said, if you go with a hosting service like Bluehost, you’ll get yours for free). Now picking a blog name was probably the hardest step for me as new blogger. I would think of some amazing blog names and then of course it would be taken. Or someone would have already bought it and be sitting on it and waiting for someone to purchase it (when someone does this, they’re usually a few thousand dollars, so just ignore them). I’d also have trouble with finding one that wasn’t too long, that sounded cool to others, and was easy to remember. At first, we were thinking about going with something like “The Happy Housewife.” But that wouldn’t have worked for very long; especially since I travel full-time now, I’m not even a house wife! And if you’re struggling to know how to come up with a great blog name, then you can definitely check out our tips on finding the right one for you (No fluff, I swear!). When picking a niche, usually people blog about their passion, but sometimes, their passion can be very niched. And that’s fine, I’ve seen many bloggers be successful in topics I would never have thought of (I’ve seen someone have hundreds of thousands of followers on Medieval history!). But, you do need to make sure you know how to market it right whether it’s through Facebook or Pinterest. You have to know how to grab reader’s attention or it might take a bit longer than you want it to. Otherwise, if you’re blogging for profit, it can become very frustrating. Now if your passion is something that’s not as narrowly-niched, but more along the lines of something more mainstream like money, DIY, food, or style then this is great! However, there is a question I get from people regarding niches that are well-known. And the easy answer is… yeah! Of course! My husband and I both write on very popular subjects and were able to get over 100k views in our second month after our blog launched. A great and easy way to do this is by looking at what those other bloggers have written about, and then add value where they don’t. So for instance, if you want to write on money, then see what another money blogger is talking about. If they’re writing about how their readers can make money through doing surveys on this one site, then research and find more than one reputable survey site your readers can test out. Studying those who have written on your topic of choice long-term and have had great success with it, these are the people who want to watch and imitate. They know what they’re doing and soon after enough practice, you will too. If you go with a hosting service like Bluehost, then you’ll automatically be given a list of free themes to choose from. And I wouldn’t go overboard with them! These themes allow you to choose colors and fonts and such, but if you don’t want to spend hours figuring things out, then I’d put that off until you have money to pay someone to go through and design your site for you (it actually doesn’t have to cost a ton). However, if you do have enough money right now, then I’d go through some paid themes that you like more and have better features. Now the next thing you want to do is to create your own logo. This can be as simple as choosing a font for your blog name or having someone on Fiverr design one for you for $5. Another option is to go to free online and easy to use sites like PicMonkey or Canva. There you can play around with settings and figure out how to create your own logo, which is a great option if you want to wait until you’re making money with your blog. But I’d say, since you’re just starting out, don’t spend too much time on this part of your blog. There are more important things to focus on. It can really be great to share your ideas and inspiration with the world. But if you’re having trouble coming up with ideas, then one of my best tips is to look at other big bloggers in your niche and see what they’re writing on. Then go through their post and see where they’re lacking value. What tips are they not giving their readers that you could provide. Another great idea is to go onto Pinterest and see what people are searching for in your niche. This shows that they’re popular subjects and will help you when brainstorming. Quick Tip: If you want to learn how to start a blog and publish your first blog post, you can check out my video tutorial here! Now if you don’t have a great camera and/or you’re not good with photoshop, then don’t worry about it! There are plenty of great sites like Pexels, Unsplash, or Pixabay which will give you great free stock images for your blog posts. You can find some amazing high quality photos that will make your blog look super sharp! Elite Blog Academy (or EBA as it’s affectionately called by its students), is an online course that will take you step-by-step from launching your blog to turning it into a full-time income source. Now Elite Blog Academy only opens up around the beginning of March, so you can sign up for their wait list here and they’ll tell you when the cart is open! Also, you can check out my full review on the course here. Whether you’re starting a blog as a hobby or for profit, I really want this to be easy for you. And if you have any questions, just let me know, I’d be glad to help! Also, What Do You Want to Blog About? I’d love to know!